From day one — Dec. 12, 2014 — Gloria McBryde Benton has walked every step with me. We became fast friends as we found out that we had much more in common than her being my oncology nurse. She was the nurse of choice among the members of my church. At least five members were being treated for cancer at Fort Belvoir simultaneously, and the word was: Ask for Gloria. I soon saw why. Gloria embraced me, my caregivers and my family. She has yet to meet a stranger. She has an outgoing personality, and her smile and laugh are infectious. But Gloria takes care of business: She’s firm and sturdy when it comes to the care of her patients. There is no time to play when it’s treatment time. She puts on her game face, and we get down to business. One expects nurses to know their craft and do it well, and Gloria does. But she goes beyond knowing and doing her craft: She is selfless. She answers text messages at 2 a.m. and even responded to questions when she was on a Caribbean cruise. She never gets tired of answering the same questions over and over again. She makes herself available 24/7. I went into remission in 2015, but the cancer returned in 2016. Now that I’m back in treatment, I know better than to keep her on duty 24/7. Still, I know she is always there — and she gives of herself not only to her patients but also to everyone she comes in contact with at the clinic. With Gloria, we don’t always have to talk about cancer. There is life beyond cancer. It’s nice to chat about her children and her husband and her mom. It’s refreshing when she asks about my family and my friends. She’s met a portion of my village, and she understands the stress that goes along with being a caregiver. We talk football (sometimes it’s more of a debate), but we both love the game and do a lot of Monday morning quarterbacking during my treatment sessions. We usually solve a few of the world’s problems, too — if only someone would listen to what we have to say! I have the best of both worlds: the best oncology nurse and the best global problem solver. Gloria and I also connected because we discovered we are sorority sisters. We belong to Delta Sigma Theta, a public service sorority. Although we became members at our respective universities — Gloria at North Carolina A&T State University and me at the University of Alabama — our alumnae affiliation has brought us together in northern Virginia. 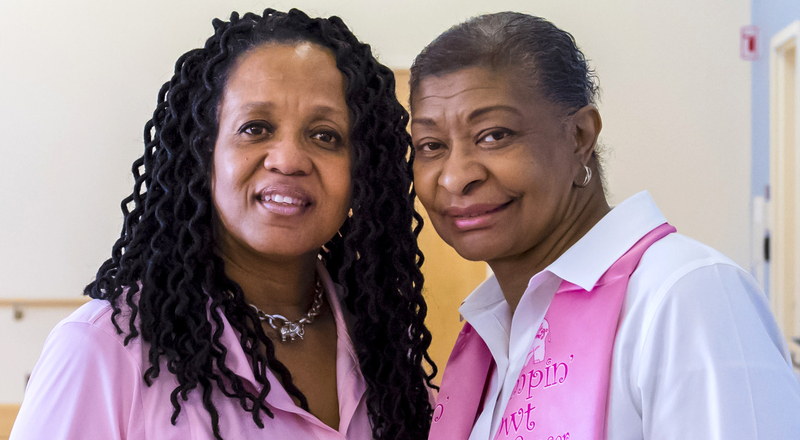 Gloria’s compassion for others was rooted in her long before she became an oncology nurse, as one of the criteria to become a member of the sorority is to have a record of public service. Gloria has a sixth sense. You may come to treatment with a smile on your face, but she has the ability to see beyond the smile and into your heart and soul. There are good days and not-so-good days. She picks up on both. When life gets hard, she can just look at my face, say nothing and give me a hug. She is reassuring, loving, firm, gentle, kind, sweet, capable, preventive, methodical, attentive, strong, intelligent and smart. She is never in a hurry and always willing to spend extra time and just listen if she senses you need it; that sixth sense makes her extraordinary. We laugh and cry about everything. We share everything. My primary caregiver, Greg, loves Gloria. He has developed his own relationship with her, and he needs that relationship. They talk so much that I sometimes have to remind them that I am in the room. We truly have become family. It is so helpful to know that my nurse is my health care provider, my friend, my sorority sister and my family. What Gloria does from day to day with the same passion is extraordinary. Her work is her love, and when someone is taking care of you because they want to and because they care about you as a person, that makes all the difference in the world. If I had to compare Gloria to any of the superheroes, I’d say this about my oncology nurse: She is faster than Wonder Woman. She is much nicer than Catwoman. She is more helpful than Batgirl. She is stronger than the Bionic Woman. Gloria Benton is my shero! God placed Gloria Benton in my life, and I am so grateful that she is my oncology nurse.